What is Volutella blight? Volutella blight is a common and potentially lethal disease of Japanese pachysandra (Pachysandra terminalis), an evergreen, semi-woody groundcover that is grown in shade gardens throughout hardiness zones 4 and 5 in Wisconsin. Volutella blight can severely limit the aesthetic appeal of pachysandra wherever it is grown. 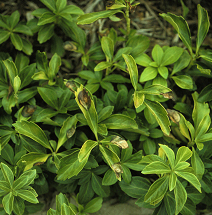 Volutella blight often starts as lesions on individual leaves, but can eventually kill groups of pachysandra plants. What does Volutella blight look like? Volutella blight begins as discrete, water-soaked areas (lesions) on pachysandra leaves and stems that eventually turn black/brown and become necrotic (i.e., die). Lesions can be circular, oval or irregular in shape, and may have darker margins. Distinct concentric rings also may be visible in the lesions. Lesions on a single leaf can merge and cause the collapse of the entire leaf, while stem lesions can lead to the collapse of an entire pachysandra plant. When severe, Volutella blight can kill large patches of a pachysandra planting. Where does Volutella blight come from? Volutella blight is caused by the fungus Volutella pachysandricola which survives in infected plants, as well as on and in pachysandra plant debris. During wet weather, this fungus produces masses of light-orange to pink fungal spores and hyphae (i.e., fungal threads) that may be visible to the naked eye. How do I save a plant with Volutella blight? Remove diseased leaves, as well as any leaf debris, and prune back or dig up plants with stem infections. Be sure to prune only when plants are dry to minimize the spread of the causal fungus. When disease is severe, remove diseased plants, then follow with one or more applications of a broad-spectrum fungicide (e.g., one containing chlorothalonil). Select a product that is labeled for use on pachysandra, and follow all label instructions to ensure that you apply the product in the safest and most effective way possible. How do I avoid problems with Volutella blight in the future? V. pachysandricola is a somewhat opportunistic pathogen, most often causing problems on pachysandra that is weakened or under stress. Therefore, reduce any stresses where possible. Reduce stress due to overexposure to sun by always planting pachysandra in a shady area. Do not overcrowd new plantings, and thin existing beds to not only reduce stress from competition, but also to promote good air flow and rapid drying of plants. Dry plants are less likely to become infected than plants that stay wet for extended periods. To prevent water stress during the summer and reduce winter injury over the winter, established pachysandra should receive approximately one inch of water per week during the growing season up until the point where there is snowfall or the ground freezes. Newly planted pachysandra should receive approximately two inches of water per week. Minimize salt usage on sidewalks or driveways near pachysandra beds to limit salt injury. Control insect pests and avoid over-pruning of pachysandra to limit wounds that might serve as entry points for V. pachysandricola. For more information on Volutella blight: Contact your county Extension agent. Thanks to Diana Alfuth, Laura Jull and Christine Regester for reviewing this document.